Born 6 Aug 1943; died 16 Oct 1998 at age 55. Jonathan Bruce Postel was an American computer scientist who played a pivotal role in creating and administering the Internet. In the late 1960s, Postel was a graduate student developing the ARPANET, a forerunner of the Internet for use by the U.S. Dept. of Defense. As director of the Internet Assigned Numbers Authority (IANA), which he formed, Postel was a creator of the Internet's address system. The Internet grew rapidly in the 1990s, and there was concern about its lack of regulation. Shortly before his death, Postel submitted a proposal to the U.S. government for an international nonprofit organization that would oversee the Internet and its assigned names and numbers. He died at age 55, from complications after heart surgery. Born 6 Aug 1844; died 21 Oct 1896 at age 52. Born 6 Aug 1840; died 18 Mar 1914 at age 73. Swiss-American anthropologist, historian and archaeologist who was among the first to study the American Indian cultures of the southwestern United States, Mexico, and Peru-Bolivia. He was one of the first to use the methodology of participant observation, by living with the Indians and studying their culture, artifacts and the ruins on their land. He followed their ancestors' migration from northern Mexico, down the Rio Grande Valley, to central Mexico. Even though Bandelier was criticized for being untrained and forming premature conclusions, he proved that working and training in the field was just as effective as going to school. With many archaeological sites, the Bandelier National Monument in New Mexico was named after him. Bandelier: The Life and Adventures of Adolph Bandelier, by Lange and Riley. - book suggestion. Born 6 Aug 1838; died 10 Mar 1900 at age 61. Born 6 Aug 1828; died 12 Dec 1917 at age 89. 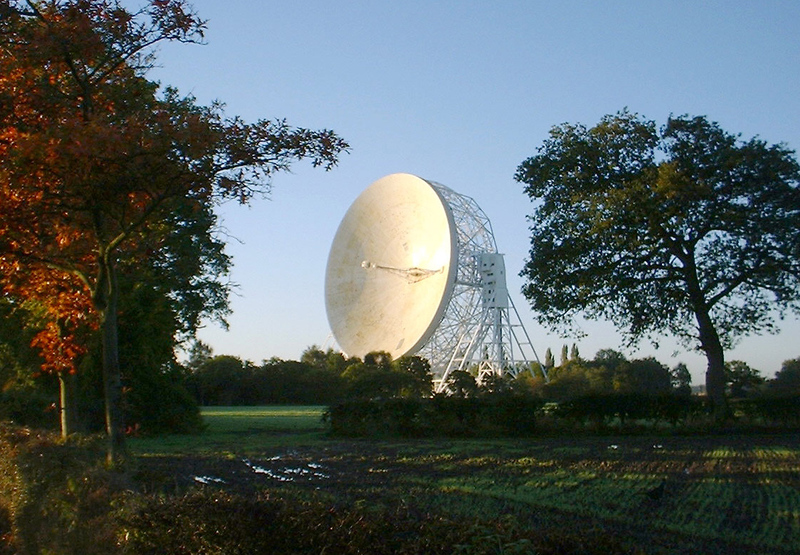 The Story of Jodrell Bank, by Bernard Lovell. - book suggestion. Died 6 Aug 2007 at age 90 (born 14 Jun 1917). Died 6 Aug 1979 at age 68 (born 6 Apr 1911). Died 6 Aug 1976 at age 63 (born 15 Aug 1912). Died 6 Aug 1930 at age 83 (born 24 Jan 1847). French chemist who was the first to present a theory on the relationship between molecules and how they absorb or reflect light. Born into a family wealthy in petroleum holdings, he was able to build his own laboratory to pursue his work. He theorized (1874) that optical activity - the presence of two forms of the same organic molecule, one a mirror image of the other - is due to an asymmetric carbon atom bound to four different groups. For this contribution he is regarded as the cofounder of stereochemistry, with J. H. van't Hoff. His interests also included petrochemistry, cosmology, and biology.Birth date: DSB gives 24 Jan 1847; Enc. Brit. gives 21 Jan 1847. Died 6 Aug 1925 at age 72 (born 12 Jan 1853). Died 6 Aug 1911 at age 57 (born 19 Sep 1853). Died 6 Aug 1879 at age 73 (born 13 Dec 1805). Scottish-born German astronomer noted for discovering (1852) that the magnetic field of the Earth fluctuates with a 10.3-year activity cycle, but does not correlate it with the period of the sunspot cycle. From 1 Aug 1840, Johann von Lamont (as director of the Royal Astronomical Observatory in Munich) started regular and permanent observations of the earth's magnetic field. In the 1850's he started making regional magnetic surveys in the kingdom of Bavaria, later extended to other states in south Germany, France, Holland, Belgium, Spain, Portugal, Prussia and Denmark. His central European maps with isolines of geomagnetic elements, reduced to 1854, were the first worldwide. Died 6 Aug 1846 at age 73 (baptized 29 Jun 1773). Italian physician, astronomer, geologist and poet who proposed a scientific germ theory for how diseases are transmitted In De contagione et contagiosis morbis et curatione (On Contagion, Contagious Diseases, and Their Cure, 1546), he described the spread of disease by so-called "seeds", that could be transported by air, upon clothing, by an animal or from one person to another. (He was extending Lucretius's earlier idea that everything was composed of small bits of atomic matter.) Fracastoro's ideas helped make unpopular public health measures more accepted, such as destroying animals, or thorough cleaning or burning of infected possessions during a plague. His ideas preceded the work of Louis Pasteur and Robert Koch by more than 3 centuries.Date of death: DSB gives 6 Aug 1553; Enc. Brit. gives 8 Aug 1553. The Bill Schroeder Story, by Martha Barnette, Schroeder Family. - book suggestion. Shockwave: Countdown to Hiroshima, by Stephen Walker. - book suggestion. In 1930, Norwegian explorers on White Island (Kvitöa) discovered the debris of the earliest balloon expedition to the North Pole. They also found the remains of a balloonist, diaries and photos. On 11 July 1897, Dr. Salomon August Andrée of Sweden and two companions had left Danes Island, Spitsbergen in a balloon, Eagle, which he had built himself, hoping to drift over the North Pole. This was the first attempt by air to explore the Arctic. Nothing was heard of them for 33 years. The diaries recorded that just two days after their launch, an emergency landing on ice had been made. They eventually met their end in the bitter cold on the island, still hundreds of kilometres from the North Pole.